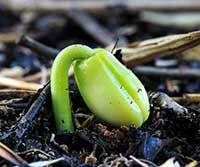 In the wild, as wildflowers bloom and ripen into seed all summer and into fall, the seed simply falls to the ground and is "planted". Like fall-seeded lawns, a fall-planted wildflower seed has a chance to "settle" into your site during the winter, and is ready to burst into growth in early spring. This is why fall-planted wildflower seed is up and in bloom about 2 weeks earlier than spring-planted seed. When a wildflower gardener tries to emulate this process, we do all we can to "help nature along." That means, we clear the area, open the ground, provide good seed-to-soil contact for every seed, water if necessary, and do anything else to assure our seeding's success. It's easy and the work is the same as required for a spring planting. In fact, some people think fall planting is easier. The ideal period for fall planting is roughly six weeks before the first hard frost. In northern areas of the country the ideal planting period might even be late summer. In general, the window of opportunity for most folks is during September and October. Why is fall planting so good? In the fall, the warm soil encourages root growth. Roots continue to grow through the winter until the ground freezes –in areas with mild winters roots may continue to grow. In early spring roots begin new growth or continue to develop at a faster rate and begin top growth. While the same plant planted in spring gets a slow start due to cool soils, the fall-planted plants are becoming well established. Plant Spring Ephemerals in Early Fall. Spring-blooming perennials, especially in the bare root form, are best planted early in the fall. Planting in the fall while the soil is still warm will give the roots enough time establish properly. This allows the plants to emerge from well-established roots, with a stronger start, the following spring. The soil temperature is warmer in the fall than it is in spring, and this encourages root growth. And since the plants are usually not producing flowers, they’ll have more energy for root establishment. Frost will stop the growth of the plant above ground, but it will not kill the plant. The roots will continue to grow until the soil freezes solid. At the end of the growing season many of our native perennials have finished their growth cycles, and they may not be looking their best. Spring ephemerals are completely dormant in the fall, with no growth showing above the roots. Because of this complete die-back, ephemerals are often shipped as bare root stock. Plants that bloomed earlier in the summer will also be well past their prime and may look very tired as they head towards winter dormancy. Simply plant them with the same care that you would bestow upon a thriving green plant in the spring.